Dimensions 0.50 by 6.25 by 9 in. Climate change has had a significant impact globally, predominantly for those vulnerable to its influence. The first book of its kind, The Climate Resilient Organization assesses the issues that have mounted for decision-makers in the field, while providing strategies to tackle them. With a particular focus on building climate-resilient pathways for private sector organizations, the expert authors offer practical tools and decision-making criteria for evaluating adaptation needs, costs and benefits. Split into two parts, this book begins with an analysis of the subject on a global scale; it continues by translating the science surrounding it while presenting it in a manner suited to local decision-makers. 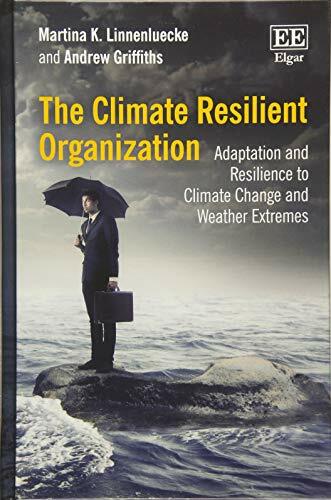 Sustainability and climate adaptation scholars as well as managers will equally find this book to be an insightful read. Government officers and risk management professionals will also find the topics discussed beneficial to their work. About: 'Drawing together understandings from science and business around the increasingly important concept of resilience, this book provides managers, academics and practitioners with important ideas that will help business prepare for the future.